The 200-year-old British chocolate maker may soon be owned by U.S. food giant Kraft. London, England (CNN) -- The board of British chocolate maker Cadbury accepted a buyout offer from American food giant Kraft Tuesday, a deal that would end the nearly 200-year-old independence of the beloved British brand. The board has agreed to recommend the offer to Cadbury shareholders, who have until February 2 to decide -- but they are expected to approve it. Kraft's offer Tuesday is its biggest one yet for the maker of Creme Eggs and Dairy Milk chocolate bars. 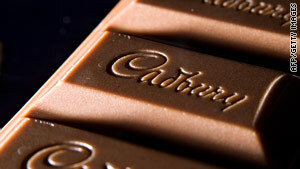 It values Cadbury at £13.3 billion ($21.8 billion), or £8.40 ($13.77) per share. In addition, Cadbury shareholders will be entitled to receive 10 pence (16 cents) per Cadbury share. "We believe the offer represents good value for Cadbury shareholders and are pleased with the commitment that Kraft Foods has made to our heritage, values, and people throughout the world," Cadbury Chairman Roger Carr said in a statement. He said Cadbury would work with Kraft to ensure the growth of the business for customers and employees. "We have great respect for Cadbury's brands, heritage, and people," said Kraft Chairwoman and Chief Executive Irene Rosenfeld. "We believe they will thrive as part of Kraft Foods." Will takeover affect Cadbury's taste? Cadbury had previously rejected two hostile takeover bids by Kraft because Carr said they did not value the company high enough. Illinois-based Kraft earlier this month sold its North American frozen pizza business to Nestle to finance a fresh bid for Cadbury. The January 5 sale helped Kraft boost the cash element of its offer, which would give Cadbury shareholders cash in addition to Kraft shares. There had been rumors that Swiss firm Nestle, which has a chocolate and confectionery unit, would make its own offer for Cadbury. But Nestle squelched those rumors when it bought Kraft's frozen pizza business in the United States and Canada for $3.7 billion. U.S. chocolate maker Hershey also had reportedly been considering a $17.9 billion bid for Cadbury. Cadbury is a beloved brand in Britain, producing chocolate products that have become a cultural fixture. Its Dairy Milk and Bournville brands have been around for more than 100 years, and its Milk Tray and Roses samplers -- which are still sold today -- were some of the first to be marketed as an everyday purchase. John Cadbury established his shop in Birmingham, England, in 1824, selling drinking chocolate alongside coffee and tea. Cadbury, a Quaker, was trying to give people an alternative to alcohol, which he thought destroyed lives, according to the company. Kraft's roots go back to 1903, when J.L. Kraft began selling cheese from his horse-drawn wagon in Chicago, Illinois. Today the company owns products from Oreo Cookies and Jell-O gelatin to Philadelphia Cream Cheese and Miracle Whip salad dressing, though it may be most famous for its Macaroni & Cheese instant dinner and Velveeta processed cheese products. Kraft's takeover of Cadbury has also been criticized by British trade unions who urged the UK government and the EU to block the bid. Unite, the UK's largest union said a merger will destabilize the company and hit future returns to shareholders. Outside Cadbury's plant in the Birmingham suburb of Bourneville on Tuesday some workers expressed their fears about possible job losses. One man told the Press Association: "There are a lot of worried people inside that building." The employee, who asked not to be named, added: "Nobody really knows what is going on or what this might mean in terms of job losses, but inside that factory there are a lot of people who are very, very worried about the future -- the future of the company and their own future, their jobs and their families. "It is not a good atmosphere here today." Would takeover affect Cadbury's taste?